This article is for beginner who are looking for how to start with the UFT. Before starting with any tool, It is important to understand the functionalities/ features of the tool as this could be the first step to start the journey of your coding (Definitely, assuming you have the tool successfully installed. :)). We will explain useful features of the tool which will help you to start with. Let’s do it. 1. Double click on the icon as shown below. 2. You will see an add-in Manager window. Select the required add-in and click on OK button. A) You will see the start page window as shown below. 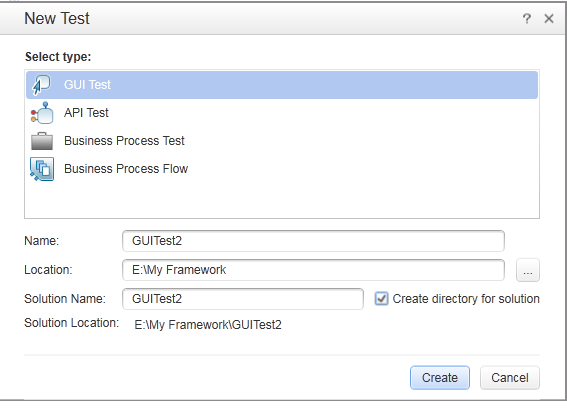 Number 1: New – Click it if you want to create a new Test. 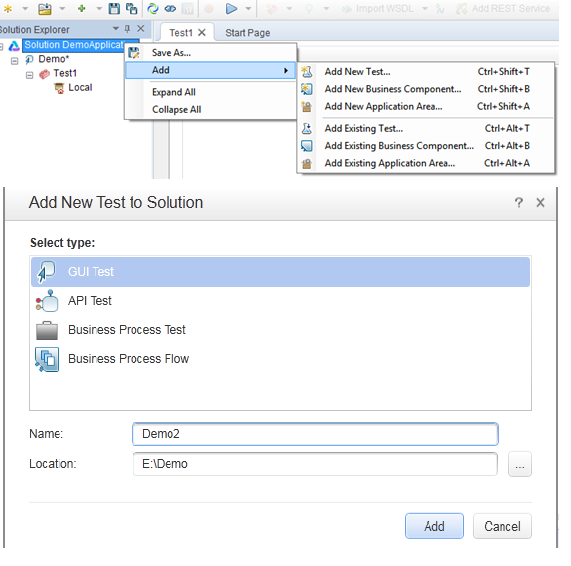 Number 2: Open – You can open your existing test which were already saved. Number 3: Recent tests/Components – This box will show you the test which you have recently worked on. If you close the tool and reopen it. Even though , It will show you the recent last used items. You can directly open last saved items from this without going into system directory. B) Options on start Page: You have 2 options there with check-boxes ‘display start page on start up’ and ‘Close start page after test loads’. If you check ‘display start page on start up’, the start page will always be displayed when you open UFT and If you check ‘Close start page after test loads’, start page will be closed when you open any test. you can also view start up page by going to ‘View’ -> ‘Start Page’. We can provide the name of our test and location where we want to save the test. We can also provide the solution name(Solution is nothing but the parent container/ Folder which comprises of all the test resources or components. 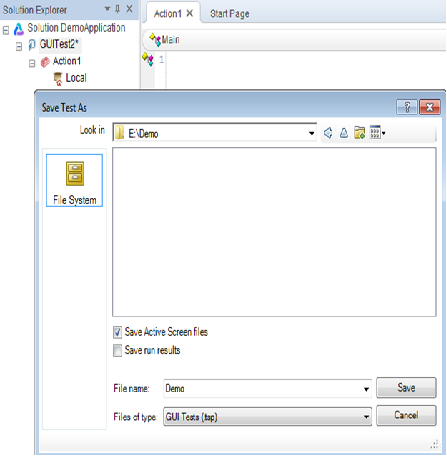 The check-box ‘Create directory for Solution’ is selected, then it will create the Folder with the name given in ‘Solution Name’. A folder will be created at the specified path as shown below. 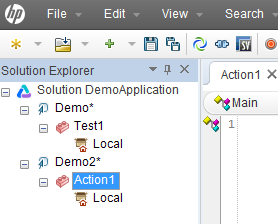 A new Action will be displayed in the solution explorer on the left side. 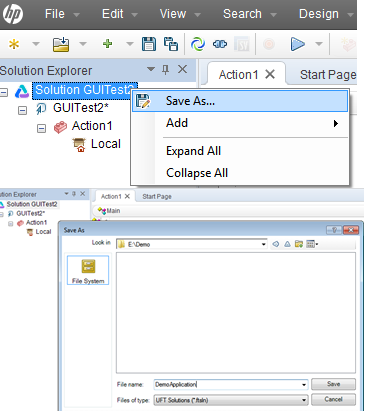 – Solution GUITest2: It is solution which will have all the test resources and components. -GUITest2: This is a Test which can have multiple Actions. Action1: Here, we will write the script. We can rename the solution,Test and Action as well. (Please look at screen shots below). Rename Action: We can rename the action as per the requirement. 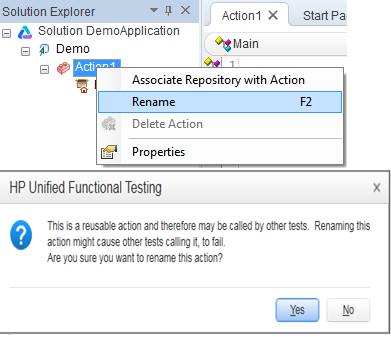 While renaming , It will give a warning that ‘If this Action is used by other test , It may cause those test to fail’. But, as this is not being used in other test , we can click ‘Yes’ and proceed. We can add new Tests as well in the same solution. 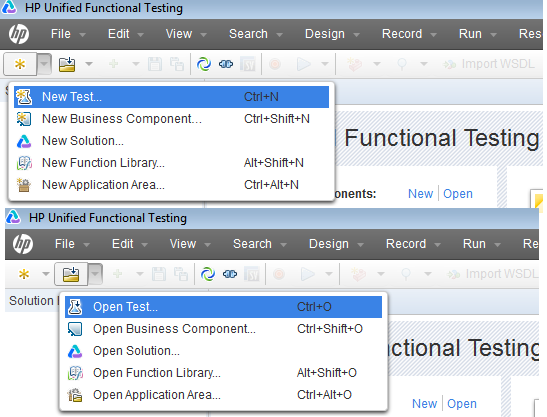 you can use the same feature from file menu also as shown below for create a new test and opening a existing test. You can see other options also in the dropdown , we will discuss about them later. Active Screen Pane: This pane will show you the screen shot captured during the recording time. It will capture a screen shot for each and every recorded step. Once you click on the recorded step in the script editor, the same object will be highlighted in the active screen. Data Pane: This pane is very useful. This is basically used for data parametrization. You can go to File –> Settings–> Resources. Select Other location radio button and provide the path of your excel sheet. 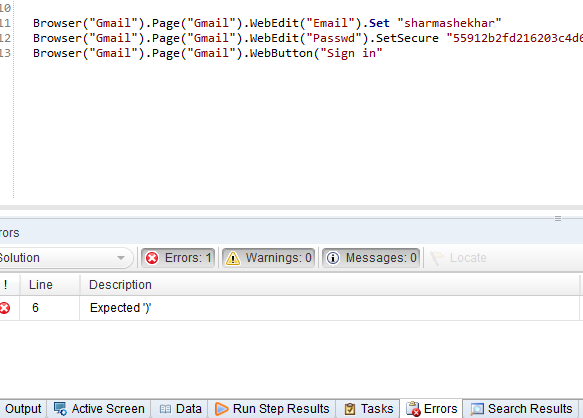 It will be attached to the Data Pane and look like below screen. Error Pane: This pane will provide you the information about the missing resources and syntax error if any. 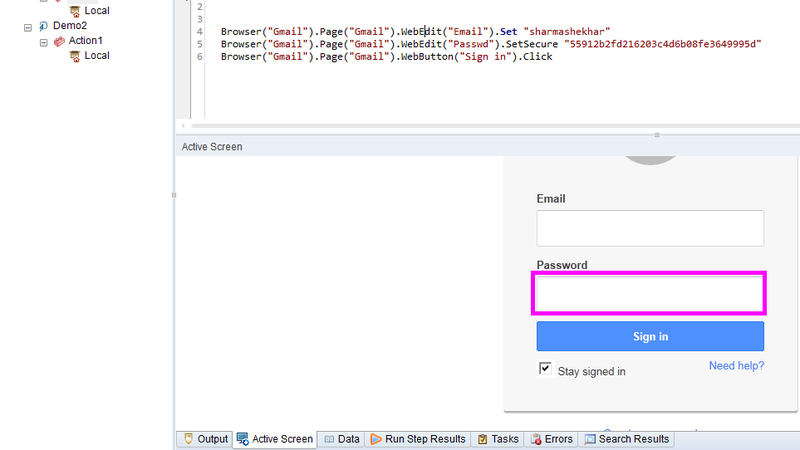 We can double click on the error and it will take us to the particular line in the script. It will be opened automatically if UFt detects any error. Debug Pane: This is very useful pane and used while the script is in debug mode. It has following sub pane. Remaining part will be completed in the Part 2.